This checkered cake was invented during the Victorian era to celebrate the wedding of one of Queen Victoria's granddaughters to a German prince—not exactly an auspicious start for a cake widely enjoyed in Ireland. But the two countries share more than a climate: they also have a liking for tasty treats that accompany an afternoon cup of tea. 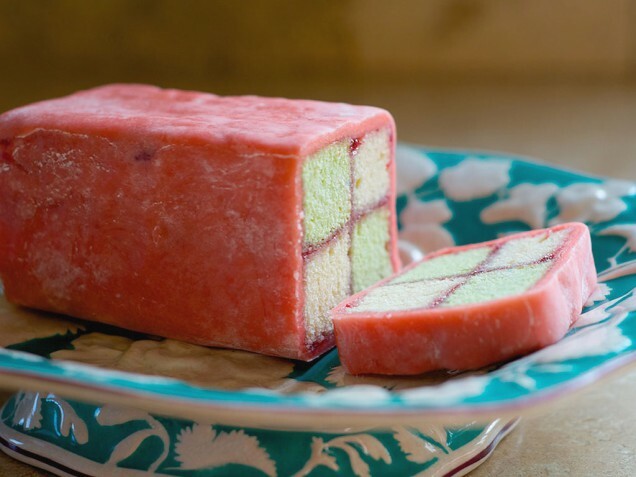 We've updated the pink and white of the traditional Battenburg cake to a green and white check and wrapped it in orange-hued marzipan to make the whole thing decidedly Irish. It looks like a million bucks when you're done, and it's a lot easier to make than it looks. 1 Preheat the oven to 350 degrees and grease two 8- x 4-inch loaf pans. 2 Beat the butter and sugar with a mixer until fluffy, then add the eggs, milk and vanilla, beating to combine. Sift the flour, baking powder and salt directly into the bowl, and mix just until no streaks remain. 3 Spoon half the batter into one of the prepared pans, leveling it out to the sides so the cake bakes evenly and doesn't dome in the center. Stir three drops of green food coloring into the remaining batter in the bowl, then spoon the green batter into the other pan and level it. Bake both pans for 12 to 15 minutes, until a tester in the center comes out clean. Cool for 10 minutes in the pans, then turn onto a rack and cool completely. 4 While the cakes are baking, line a clean work surface with a large square of parchment paper or wax paper. Dust with confectioners sugar and put the marzipan on the parchment. Knead it with your hands until pliable, then add one drop red and one drop yellow food coloring to the surface of the marzipan. (You may want to wear rubber gloves to keep from staining your fingers. Knead to distribute the color throughout. If you want a darker orange, add colors one drop at a time to avoid overwetting the marzipan. Set the orange marzipan aside. 5 To assemble, cut each cake in half lengthwise and brush all the exterior surfaces with apricot jam. Lay one white and one green slice side by side, pressed together, then top those two with one green and one white slice, to make a checkerboard. Press the four pieces together firmly with your hands. 6 Sprinkle more confectioners sugar on a clean work surface and use a rolling pin to roll the marzipan to a rectangle about 1/8-inch thick. 7 Set the cake on the marzipan and roll it up in the marzipan, leaving the ends uncovered. 8 Pinch the seam to seal and trim a very thin slice off each end with a serrated knife to even up the cake. Cut into 8 or 10 slices to serve.